Morgan Farm at Frog Pond is a project by Pahlisch Homes. New homes at Morgan Farm will be the first phase of the multi year Frog Pond master plan. Featuring approximately 78 one and two level single-family homes on 4,000 to 5,000 square foot lots. 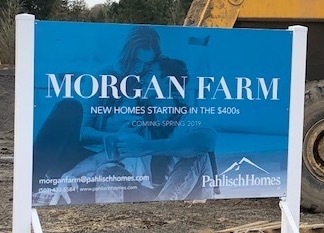 Pahlisch is breaking ground now on this first phase at Morgan Farm and estimates approximately 36 lots will be available spring 2019. Pricing is targeted at the $450,000 to $550,000 price range. The Frog Pond area is comprised of three new neighborhoods totaling roughly 500 acres on the eastern edge of the City of Wilsonville. A portion of this area – the 181-acre “West Neighborhood” and a 40-acre property designated for a school and community park – is already inside the Urban Growth Boundary; the remainder lies in land designated as Urban Reserve. Frog Pond master plan is a multi year plan through 2035. This 500 acre area begins at the Old Frog Pond Grange and Stafford Road, on the east side of Wilsonville. The first portion of this area – the 181 acre “West Neighborhood” and 40 acre parcel designated for a school and community park. Wilsonville the gateway to Oregon’s wine country, and just 17 miles south of Portland. Wilsonville is a planned community that offers homes in all price ranges. With the Willamette River flowing through town and acres of public parks and gardens within the city, Wilsonville is a special place to work and live. The master plan keep growing with a focus on the Frog Pond development. Stafford Meadows is a project by West Hills Development that will feature 81 homes. Starting off the launch is the NW Natural Street of Dreams 2019 at Stafford Meadows. 2019 Street of Dreams show at Stafford Meadows will run Saturday, July 27 – Sunday August 25. The area top builders will be showing the latest in design and ammenities.